Are you considering a career in a support role in the NHS? All NHS employees share a belief in the quality of patient care. We call these beliefs our ‘Values’. It is important that our shared values are part of everything we do to ensure that our role has a positive impact on patient lives. Try our video challenge by clicking on one of the support roles opposite. Log in now and find out whether you have what it takes to join the NHS. A career in a support role in healthcare offers many different job opportunities in a wide range of settings and can involve many different sorts of job roles. Whilst skills for support roles can be learned, some things are about ‘who you are’ – your values and attitudes. The ‘Values for healthcare’ challenge will give you an idea of what working in a support role is like, and then help you check how suited you might be to working in the NHS. 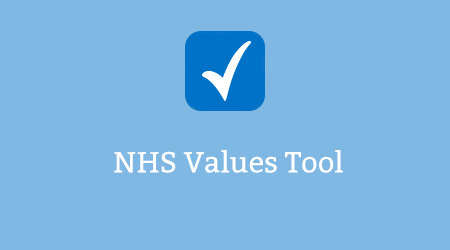 You can find out more information about the 6 NHS values by selecting each of the values below. Choose any one of the featured job roles for your challenge – don’t worry too much about having to match your choice exactly to the type of job role you are thinking about. You only need to follow one job role to complete the challenge. Each job role provides a set of questions that you might be faced with every day in the NHS, together with four possible ways to respond. When you choose an option choose the one that matches most closely what you would do. We’re interested in what you would naturally do, so do give your initial response – this is likely to be the one that best represents you. It takes about 15 minutes to complete so make sure you have enough time to get the most out of it. [Please note if you close mid-way through or navigate away your results can’t be saved and you’ll need to start again]. At the end you will receive detailed personal feedback that will tell you if you’ve got what it takes. The NHS aspires to the highest standards of excellence and professionalism in the provision of high quality care that is safe, effective and focused on patient experience. Quality should not be compromised – the relentless pursuit of safe, compassionate care for every person who uses and relies on services, requires collective effort and collaboration at every level of the system. The delivery of high quality care is dependent on feedback: organisations that welcome feedback from patients and staff are able to identify and drive areas for improvement. The value of ‘working together for patients’ is central to providing health services. Patients must come first in everything the NHS does. All parts of the NHS system should act and work together in the interests of patients, always putting a patient’s interest before the interest of the organisation, even when that involves admitting mistakes. As well as working with each other, health service organisations and providers should also involve staff, patients, carers and local communities to ensure they are providing services tailored to local needs. Every individual who comes into contact with the NHS and organisations providing health services should always be treated with respect and dignity, regardless of whether they are a patient, carer or member of staff. This value seeks to ensure that organisations value and respect different needs, aspirations and priorities, and take them into account when designing and delivering services. The NHS aims to foster a spirit of telling the truth and a culture of humility, openness and honesty, where staff communicate clearly and openly with patients, relatives and carers. Compassionate care ties closely with respect and dignity. Individual patients, carers and relatives must be treated with sensitivity and kindness. The business of the NHS extends beyond providing clinical care and includes alleviating pain, distress, and making people feel valued, recognising that their concerns are important. The NHS seeks to improve the health and wellbeing of patients, communities and its staff through professionalism, innovation and excellence in care. This value also recognises that to really improve lives the NHS needs to be helping people and their communities take responsibility for living healthier lives. We have a responsibility to maximise the benefits we obtain from NHS resources, ensuring they are distributed fairly to those most in need. Nobody should be discriminated or disadvantaged, and everyone should be treated with equal respect and importance. Did you know there are many support roles in the NHS? Some roles involve providing direct care for patients whilst other roles involve back office roles either in a hospital setting, in the community or in a GP Practice. Watch this video to find out more about the role of the healthcare assistant. Working in reception is one of many administrative support roles which provide essential support to doctors, scientists, nurses and other healthcare professionals. There is a wide choice of roles and places to work. You might enjoy dealing with patients and their relatives, for example as a receptionist in a clinic or a clerk on a ward. Alternatively, you might prefer working closely with a consultant as a medical secretary. Watch this video to find out more about working in a reception role. Without strong financial management, the NHS wouldn’t be able to provide medical treatment and clinical care. Managing the finances of a health organisation, whether it is a hospital, ambulance service trust, mental health trust or clinical commissioning group, is like running the finances of a large company. Watch this video to find out more about working in a finance department. Estates and facilities managers are concerned with the places where care is delivered, both the buildings themselves and the systems that keep them running such as heating and lighting. The NHS has a huge number of properties to look after, making estates and facilities managers a very important part of the management team. Watch this video to find out more about working in an estates team.